Mrs. Ute Nowak and a few of the students in her English class in Gymnasium Wandlitz, are working on tape recording for their "Action Day" presentation. Politicians in the village of Wandlitz located near Berlin, Germany, are talking about closing Gymnasium Wandlitz, a school that has had a subscription to Silver International for five years. But students took part in an “ Action Day” to let everyone know that they don’t like the idea of closing their school. Students in the English class sent some writing about that day. We have selected little from the students’ essays. 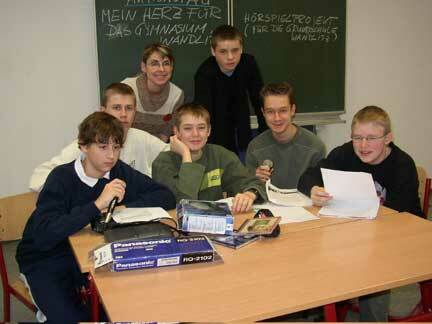 In the last few years many schools in Germany were closed due to the decreasing birth rate. Also our school in Wandlitz has to fight with this problem. Luisa K. and Luise R.
One student of our school had the idea to do an Action Day for the preservation of our Wandlitz grammar school because maybe our school has to close. There were many projects in which you could take part. We and some of the students of our class were in a project with Mrs. Musewald. She is our German teacher and in some lessons with her we had the subject of the ballad “Die Brück am Tay.” In our project we had to recite the ballad on tape. But we had to produce noises. These noises must fit to the ballad. It was a little bit difficult, but it was very funny. At half past twelve, all the projects were over and we went to the gym. There some of the projects were introduced to the other students. For example students dance to rhythmic music, read out their own stories, played on their instruments, played their own theater play, made a show with inline skaters, and wrote a song for and about our school. It was a fantastic day and now we hope that our school won’t close. At 3 o’clock our headmaster gave a speech. He talked about our school and how important it is that we all stand together and fought against the school closure. Then after that came the important part of the whole day: the demonstration. All students went in front of the school along the street and held signs for example: “Our heart for Gymnasium Wandlitz"
At 12 o’clock every group made a performance. After this we made a chain of nearly every pupil. The police drove around there and took care of us. The reporters from a TV program came, too. Philip K. , Matthias M., Miguel F., Robert Z. and Benjamin S.